The main difference between mast cell and basophil is that a typical mast cell contains around 1000 small granules whereas a basophil contains around 80 large granules. Furthermore, mast cells mainly occur inside tissues while basophils mainly occur in the circulation. Mast cell and basophil are two types of white blood cells which contain granulocytes. Both are essential components in allergic reactions. A mast cell refers to a type of white blood cell inside tissues. It is a granulocyte and contains a large number of small granules. These granules are filled with histamine and heparins. The main function of mast cells is to release these components to the tissue space in response to inflammation or allergic reactions. Other functions of a mast cell are angiogenesis, wound healing, defense against pathogens, etc. Mast cells are very similar to basophils in the circulation, both by structure and function. Also, there are two types of mast cells. Namely, they are connective tissue-type mast cells and mucosal mast cells. Wherein, the function of the mucosal mast cells depends on T cells. Upon binding with the antigen-bound immunoglobulin E, the mast cells rapidly degranulate, releasing histamine, proteases like chymase and tryptase, and cytokines like TNF-α. Moreover, mast cells are responsible for the early phase of the allergic reaction. Basophil is a type of white blood cell found in the circulation. It accounts for 10% of the total white blood cell count in the circulation. It is also a granulocyte filled with granules, containing histamine and heparin. In general, these chemicals are responsible for inflammation, allergic reactions, and asthma. Heparin is an anticoagulant which prevents blood clotting while histamine is important in allergic reactions. Mast cell and basophil are two types of white blood cells with granules. They share a common precursor cell in the bone marrow, which expresses CD34 molecules. Also, their appearance is similar. Furthermore, both contain histamine and heparin. Besides, antigen-bound immunoglobulin E binds to both mast cells and basophils, releasing histamine and other inflammatory mediators. The main function of mast cells and basophils is their role in the inflammatory process. Moreover, these cells are the components of both innate and the adaptive immunity. 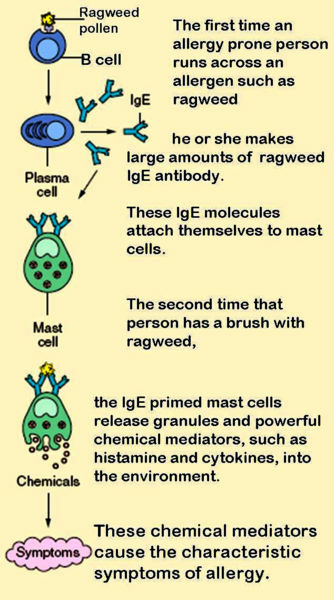 Mast cell refers to a cell filled with basophil granules, found in numbers in connective tissue and releasing histamine and other substances during inflammatory and allergic reactions. 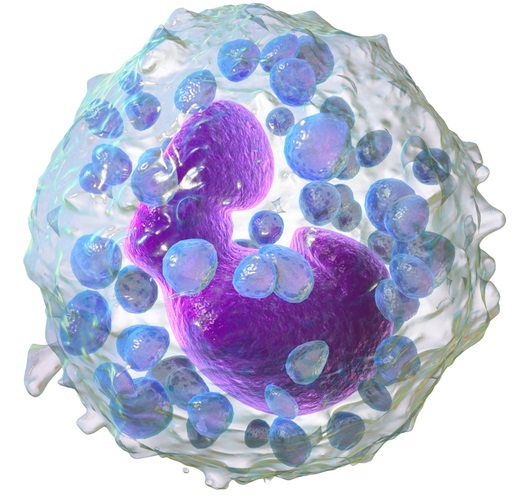 In contrast, basophil refers to a type of immune cell that has granules (small particles) with enzymes that are released during allergic reactions and asthma. Immature mast cells leave the bone marrow into the circulation and then matures when entering a tissue while mature basophils leave the bone marrow. Thus, this is a difference between mast cell and basophil. Also, the location where they occur is a major difference between mast cell and basophil. Mast cells occur inside tissues while basophils occur in the circulation. 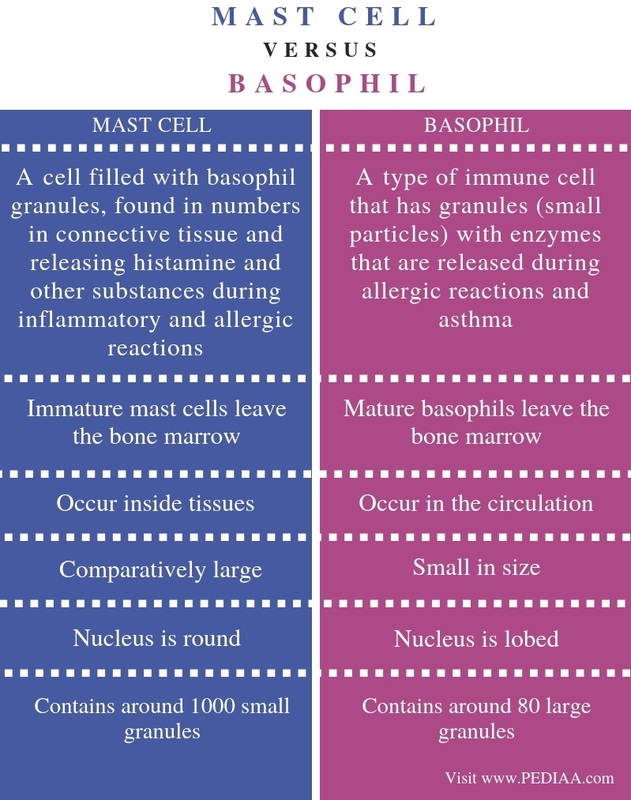 In addition, another difference between mast cell and basophil is that the mast cells are comparatively large while basophils are small in size. Furthermore, the nucleus of the mast cell is round while the nucleus of the basophil is lobed. This is another difference between mast cell and basophil. Moreover, mast cells contain small granules while basophils contain large granules. Furthermore, the number of granules in a mast cell cytoplasm is around 1000 while the number of granules in a basophil is around 80. A mast cell is a type of white blood cell that occurs inside tissues. Mast cells contain a large number of small granules in the cytoplasm. On the other hand, basophils are another type of white blood cells that occur in the circulation. Basophils contain a fewer number of large granules in the cytoplasm. Both mast cells and basophils are important in triggering inflammation and allergic reactions. Therefore, the main difference between mast cell and basophil is the type of granules in the cytoplasm and their location.